Elizabeth Spires’ new book A Memory of The Future will be published on July 24th, 2018 by W. W. Norton. “Zen-infused meditations on the limitations of memory, mortality, and the boundaries of human existence. 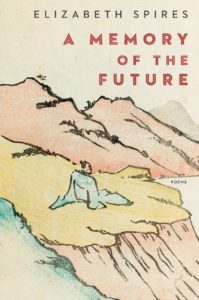 In A Memory of the Future, critically acclaimed poet Elizabeth Spires reflects on selfhood and the search for a core identity. Inspired by the tradition of poetic interest in Zen, Spires explores the noisy space of the mind, interrogating the necessary divide between the social persona that navigates the world and the artist’s secret self. With vivid, careful attention to the minute details of everyday moments, A Memory of the Future observes, questions, and meditates on the ordinary, attempting to make sense of the boundaries of existence.